A Hidden Treasure in the NY Finger Lakes: Weddings ~ Celebrations ~ Fund Raising Events ~ Carmella (our wood-fired oven) and of Course… Wild Turkeys! 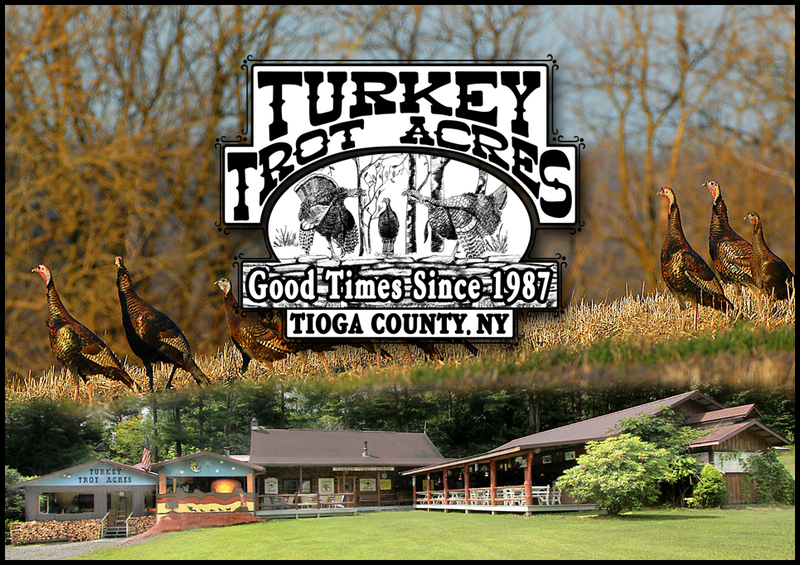 For thirty-two years, Turkey Trot Acres in Candor, New York has earned a national reputation as one of “America’s Premier Wild Turkey Hunting Destinations”. This honor was earned by over three decades of hard work and sticking to our original game plan… To provide quality hunting, lodging and dining for our guests. We are proud of the fact that all of the hunting at Turkey Trot is the “Real Deal”. We hunt under strictly fair chase conditions, no game feeders, no high fences, or pen raised gobblers. You will find thousands of acres of prime wildlife habitat and guides that know how to hunt! For more information on ‘America’s Legendary Turkey Hunting Hangout’. Click here HUNTING LODGE for all the details. Turkey Trot Lodge is a family run, all-seasons operation. During fair weather we are often the destination for folks celebrating special occasions like WEDDING RECEPTIONS. For other celebrations such as Reunions, Company BBQs, Fund Raising Events or Brick-Oven Parties visit a TASTE of TURKEY TROT.
. Discover more about ‘Forno-Bravo’ wood fired pizza ovens & our ‘Apizza Schools’ visit: EARTH~WOOD~FIRE site. Some Folks Say We Are We Out In The Sticks? SAVE THE DATE! Both Events Below are Scheduled for August 23 & 24, 2019. “After Hosting Turkey Hunters for Sixty-Two Consecutive Seasons and Posing/Taking Hundreds of Photos……Here’s A Couple of My All-Time Favorites!